Thank you for all your kind comments about my mudroom countertop skirt. You are so good to me. You didn't even give me a hard time about it taking nearly 2 years to complete! I suppose you realize by now that I am a slow poke. 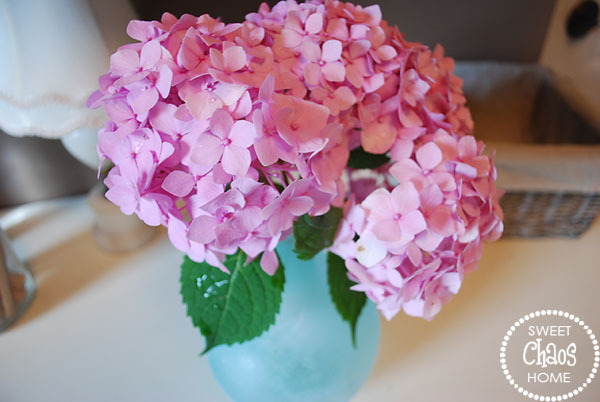 Did you happen to notice the hydrangeas in my mudroom? There are few things that make me as happy as fresh flowers. And, I'm especially giddy about these hydrangeas because they came from my backyard. I normally have a very difficult time keeping my outdoor flowers alive, let alone keeping them healthy enough to clip and bring inside. But, thanks to the unusually mild temps and rain we're experiencing in the midwest, my hydrangeas are looking fabulous. I'm thinking about trying my hand at drying them. Any tips? Seriously, these waterscape vases are my absolute favorite. I was having heart palpitations when I was picking them out. If money were no object, I would have wiped West Elm clean of them. I'd put them on every available surface in my house. I'd jump on Oprah's couch for them. That is how deeply I adore them. What about you? Have you grown anything in the backyard (that you can talk about) or made any recent purchases that make you go a little Tom Cruise crazy? Your hydrangeas are gorgeous!! They're my favorite flower to cut and bring inside in the summertime. And the color of your vases is beautiful! Love the grouping of them on your table. the blue vases are just beautiful! Beautiful color hydrangeas. When I dry them, I put them in a vase with about 2-3 inches of water. When the water is gone, the hydrangeas are usually dry, with their nice full heads & color in tact. When you pick them has a lot to do with your drying success. I pick the newer, fresher blooms. The older blooms don't tend to dry as well. Hope this helps. 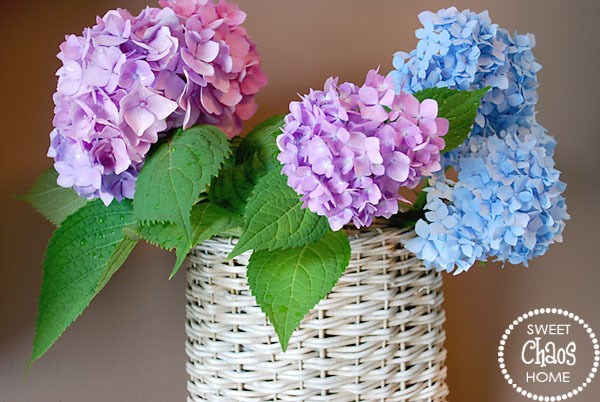 The hydrangeas look great in those wonderful vases...need to visit West Elm now! !